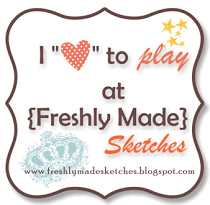 This is the Close to My Heart New Product Blog Hop. Most of the product you will see used throughout the hop is new in the CTMH 2012 Spring/Summer Idea Book and will be available for you to order beginning February 1st. The hop is a circle so if you are starting here just continue until you make your way back. If have already started, you should be coming from Michelle’s Blog. Supplies used are all Close to My Heart: X7148B Pemberley Paper Pack, Z1694 Bouquet Assortment, Z1707 Bitty Opaques Pearl Adhesive Gems, Z1718 Color-Ready Garden Wooden Shapes, Z1336 Opaques Pearl Adhesive Gems, and Indian Corn Blue and Outdoor Denim inks. I used the Spellbound sketch from the Magic book. I just love these wooden shapes! I really wasn’t sure about them at first, thinking they were nothing special but I love adding a bit of color to them and especially how they look when you stamp on them. I mean, check out those beautiful butterflies! I stamped on both of them with Outdoor Denim ink and used the Pemberley stamp set (exclusively included in the G1033 Pemberley Workshop on the Go Kit ). 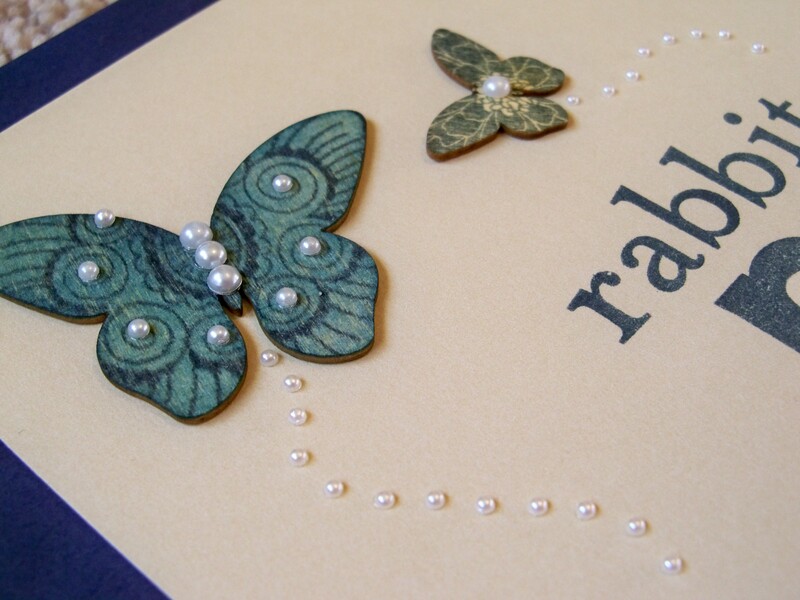 I sponged the larger butterfly with Indian Corn Blue ink before stamping. One thing to note is that you do want to be careful with the more intricate wooden shapes. They are delicate. Below is a closeup of the butterflies where you can see the pearls that I used on the large butterfly are the smaller ones on from the Pearl Opaques package. Then I used the Bitty Pearl Opaques to create the tails. Hopefully this will give you an idea of there size. They are small. I found it works best to use the Tweezers when working with them. I haven’t purchased any of the new alphabet stamp sets yet so I used Trinity Alphabet which came out in the fall. There are 4 new alphabets to choose from though so you are sure to find one that suits your tastes. Shirley’s Blog is your next stop! If you get lost along the way, you can refer to the list in the previous post. Oh Wendy!! I love what you did with the butterflies!! That stamp works perfectly with the big one!!! I would have never thought to do that on my own, so thanks so much for sharing (: I actually used a few of the shapes on a layout this weekend and I inked a couple but that was the extent of it. I can’t wait to share this with my scrap group!! OMG Wendy what a beautiful layout! I love the closeup on the butterfly! 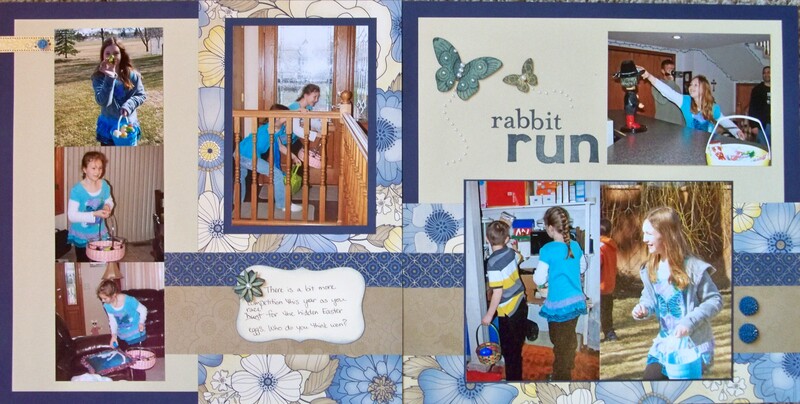 Awesome layout Wendy! I love how you’ve stamped on these little butterflies 🙂 I love them au natural as well so I’m so pleased to see what you’ve done with these ones…PS. the Trinity Alphabet was the first thing I got last catalog! and it’s one of my all time favorites! perfect size for layouts. Thanks for sharing the close up picture of the butterflies! I haven’t created with these wooden shapes yet, and was curious how they would “take” ink. 🙂 I can’t wait to order a pack of my own! Wendy, I love your layout! I really like the use of Pemberly here and the butterflies are fantastic. Darling title too, very creative. Love the bling, this paper and your layout! Great job! Wendy this layout is Gorgeous! I’m having a crop for Operation Smile in February and offering a one stamp three ways card class! I was thinking of using this stamp set and now I am sure I will! I am going to show them how you can stamp on these butterflies! Thanks so much for sharing and for the inspiration!! Awesome job with the pearls and the butterflies! So pretty!